Once your default country is selected in your Google Apps account you cannot change it. Sometime it becomes necessary to change the default country for eg: when you change your country. 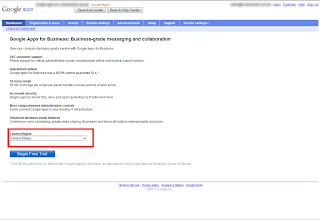 Login to your Google Apps as an administrator. 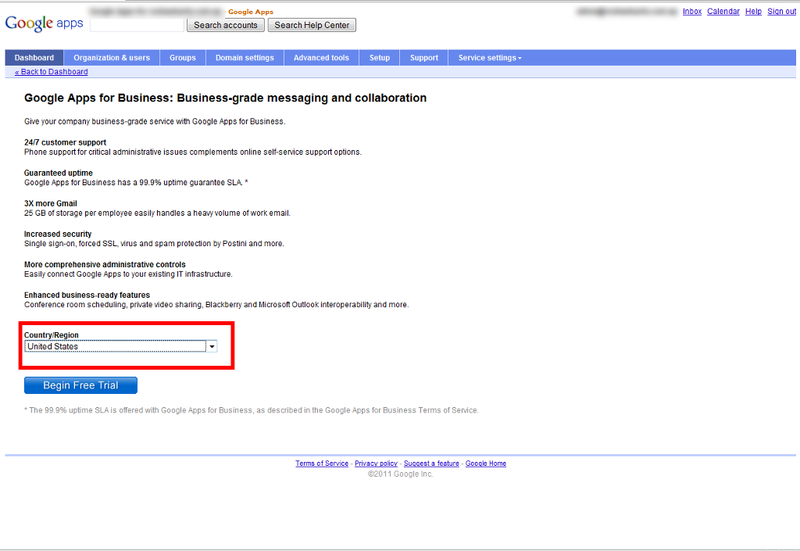 In your dashboard you'll see "Try Google Apps for Business Free". After that you'll get option to change the country as show in the figure below. Select your desire country and click 'Begin Trial'. Don't worry, we don't have to pay any buck. After this you'll reach to Google Checkout Page. At this moment close your browser. Yes close it. That's absolutely fantastic, thanks so much for sharing. You saved my day and my Google Apps! works great took actually 24 hours before i could activate youtube in my Google Apps! so be patient. Amazing workaround and a great find. Thanks! Does that still work? I can't seem to find the "Try Google Apps for Business Free" link. Tried upgrading through the control panel, but still can't find YouTube in services! You mean you upgraded and changed the default country? If so Youtube will be in service list. Try looking at the second group of service. Its almost at the bottom. I mean I did the upgrade but couldn't find the option to change the default country (like the image above), t just asked me to enter an address and I entered my US address. Two days now and the service isn't listed yet. Thanks. It worked like a miracle. Thanks a lot for the great workaround. I'm so sorry that Google didn't implement such a basic feature. And more sorry that it can be overcome by using the trick. No need to be sorry haha. Thank You So Much! Your tips save me. I got my YouTube acc back! Changed country to Germany: Youtube available, changed back to Switzerland: Youtube not available, changed again to Germany: Youtube available. Huh??!! Am I missing something here?? How do you get to Google Apps? There is no section called Google apps. There is the new Google Marketplace called Google Play. There is no area either called Google Administrator. If you google Google Apps for Business Free", you get a website where u can dowload the trial but it doesnt link to your profile, it is a separate email address that you use only for Google business. My guess is that something has changed in the last 6 months that people here were able to change their country and now that's no longer available? Please help if this is not the case. I need to change my country in the Google Play store. Unfortunately. Not for me anymore. I think that Google realized about this trick and now they just removed that option to make it impossible for the people to change country.